We are happy to announce our third guest, Pascal Régnier! Pascal Régnier is an engineer at our sponsor Airbus, and is currently working on the ESA Juice mission (Jupiter ICy moons Explorer). 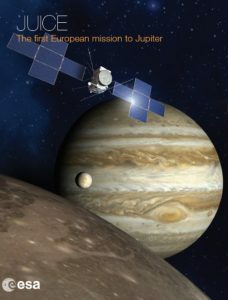 This mission (launch scheduled in 2022) will explore Jupiter satellites, which are of a great interest for scientists to understand the formation of our Solar System and the apparition of life. But how do we get there? A lot of difficulties occur when you want to travel so far away from Earth: ensure the probe has enough energy to survive, protect the probe from the radiations or compute its trajectory. Pascal Régnier, as specialist of guidance, navigation and control will tell you more about this question during SpaceUp Toulouse 2017: how do you locate and control a probe which is 750 million km away from you with a communication delay of 40 minutes?